For other uses, see Bridgetown (disambiguation). The Bridgetown port, found along Carlisle Bay (at 13°06′22″N 59°37′55″W﻿ / ﻿13.106°N 59.632°W﻿ / 13.106; -59.632﻿ (Bridgetown port)) lies on the southwestern coast of the island. Parts of the Greater Bridgetown area (as roughly defined by the Ring Road Bypass or more commonly known as the ABC Highway), sit close to the borders of the neighbouring parishes Christ Church and St. James. The Grantley Adams International Airport for Barbados, is located 16 kilometres (10 mi) southeast of Bridgetown city centre, and has daily flights to major cities in the United Kingdom, United States, Canada and the Caribbean. There is no longer a local municipal government, but it is a constituency of the national Parliament. 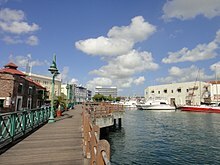 During the short-lived 1950s-1960s Federation of the British West Indian Territories, Bridgetown was one of three capital cities within the region being considered to be the Federal capital of region. The present-day location of the city was established by English settlers in 1628; a previous settlement under the authority of Sir William Courten was at St. James Town. Bridgetown is a major West Indies tourist destination, and the city acts as an important financial, informatics, convention centre, and cruise ship port of call in the Caribbean region. On 25 June 2011, "Historic Bridgetown and its Garrison" was added as a World Heritage Site of UNESCO. Although the island was totally abandoned or uninhabited when the British landed there, one of the few traces of indigenous pre-existence on the island was a primitive bridge constructed over the Careenage area's swamp at the centre of Bridgetown. It was thought that this bridge was created by a people indigenous to the Caribbean known as the Tainos. Upon finding the structure, the British settlers began to call what is now the Bridgetown area Indian Bridge. Scholars widely believe that the Tainos were driven from Barbados to the neighbouring island of Saint Lucia, during an invasion by the Kalinagos, another indigenous people of the region. Eventually after 1654 when a new bridge was constructed over the Careenage by the British, the area became known as The Town of Saint Michael and later as Bridgetown, after Sir Tobias Bridge. English settlement of Bridgetown began on 5 July 1628 under Charles Wolverstone, who brought with him 64 settlers to these lands formally claimed by James Hay, the Earl of Carlisle. Wolverstone had been sent by a group of London merchants, headed by Sir Marmaduke Rawdon. They had been granted a lease to 10,000 acres (4,000 ha) of land by the Earl of Carlisle in settlement of debts. Wolverstone granted each of the settlers 100 acres (40 ha) of land on the northern side of the Careenage waterway for the purpose of general settlement. The southern shore on Needham's Point was claimed by Carlisle's agents in October 1628. In 1631, many acres of land directly facing Carlisle Bay were passed to Henry Hawley, the new Governor; but after reports of his dishonest behaviour he was arrested and forcibly returned to England in 1639. An investigation by a Commission in 1640 found that much of Hawley's land transactions were legitimate and properly showed[clarification needed] these lands (including the town site) as being attributed to the Earl of Carlisle. Bridgetown was built with a street layout resembling early English medieval or market towns, with its narrow serpentine street and alley configuration. In 1824, Barbados became the seat of the Anglican Diocese of Barbados and the Leeward Islands. 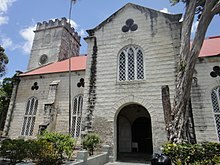 The St Michael's Parish Church became a Cathedral, so that Bridgetown became a city. In 1842, Barbados, Trinidad, Tobago, Grenada, Saint Vincent, and Saint Lucia were split into separate dioceses by Royal Letters Patent which also decreed that the Town of Bridgetown should be called the City of Bridgetown. From 1800 until 1885, Bridgetown was the main seat of Government for the former British colonies of the Windward Islands. During this period, the resident Governor of Barbados also served as the Colonial head of the Windward Islands. 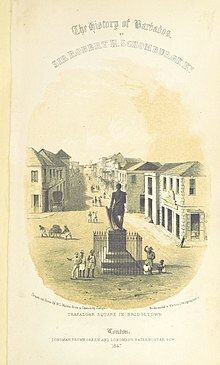 After the Government of Barbados officially exited from the Windward Islands union in 1885, the seat was moved from Bridgetown to St. George's on the neighbouring island of Grenada. In December 1925, a committee sought to petition the King for a Royal Charter of Incorporation to provide local government in the city, proposed to consist of a mayor, 8 aldermen, 12 common councillors, a town clerk, a head-borough or chief constable, and such other officers as would be deemed necessary. 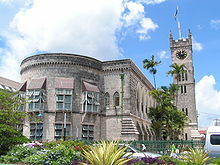 It was proposed that the island's House of Assembly should seek to incorporate the city instead of using a Royal Charter. This proposal did not succeed, but in 1958 the Local Government Act was passed in Barbados. This provided a separate administration for the city, with a mayor; 6 city aldermen; and 12 city councillors, four for each of the three wards in the city. On 20 September 1960, the College of Arms in London granted arms to the City of Bridgetown. The armorial bearings were designed by the late Neville Connell, the then director of the Barbados Museum and Historical Society, and H. W. Ince, the Honorary Secretary of the Society. Local government in Barbados did not last long. In April 1967, the Local Government Councils were dissolved and replaced by an Interim Commissioner for Local Government. The Corporation of Bridgetown thus ceased to exist, and its records and paraphernalia were deposited in both the Government Department of Archives and Barbados Museum and Historical Society. Today, Bridgetown and surrounding constituencies are administered by members of the Barbadian parliament. As established in the early 17th century, Bridgetown's centre was originally composed of a swamp, which was quickly drained and filled-in to make way for the early development. The area bounded by Highway 7 at the junction of Bay Street with Jemmotts Lane; thence in a north easterly and northerly direction following Jemmotts Lane, Martindales Road and Halls Road to the junction of Halls Road not including the said boundary roads; thence in a westerly direction following Tweedside Road and Roebuck Street to the junction of Country Road with Roebuck Street; thence in a northerly, westerly, and south-westerly direction following Country Road and Passage Road and Westbury Road to the junction of Westbury Road with President Kennedy Drive; thence in a southwesterly direction following President Kennedy Drive to its junction with Samuel Jackman Prescod Boulevard not including President Kennedy Drive; thence in a southerly and westerly direction following Samuel Jackman Prescod Boulevard to its junction with Princess Alice Highway not including Samuel Jackman Prescod Boulevard; thence continuing in a westerly direction to a point on the sea-coast; thence in a south-easterly direction following the sea coast to the junction of Bay Street with Jemmotts Lane. Beyond the boundary outlined, the wider Greater Bridgetown metropolitan area technically occupies most of the parish of Saint Michael, an area which covers around 39 km² (15 sq. mi). The above portion for the Road Traffic Act also omits much of the 90 acres of new land originally formed by completion of the Port of Bridgetown in 1961. At the heart of Bridgetown is the Careenage and Constitution River. The Careenage can be considered a marina for boaters entering or exiting the inner basin located directly in front of the Parliament buildings of Barbados. This body of water provides the city with direct access from medium-sized yachts or small craft boats. Although moderately shallow, the Careenage slices Bridgetown into two parts. During the rainy season the Constitution River flows into the Careenage area and acts as an outflow for water from the country's interior storm drainage network. Flowing into the Carlisle Bay on the southwest coast of the island. Bridgetown features a tropical wet and dry climate, with relatively constant temperatures throughout the course of the year. 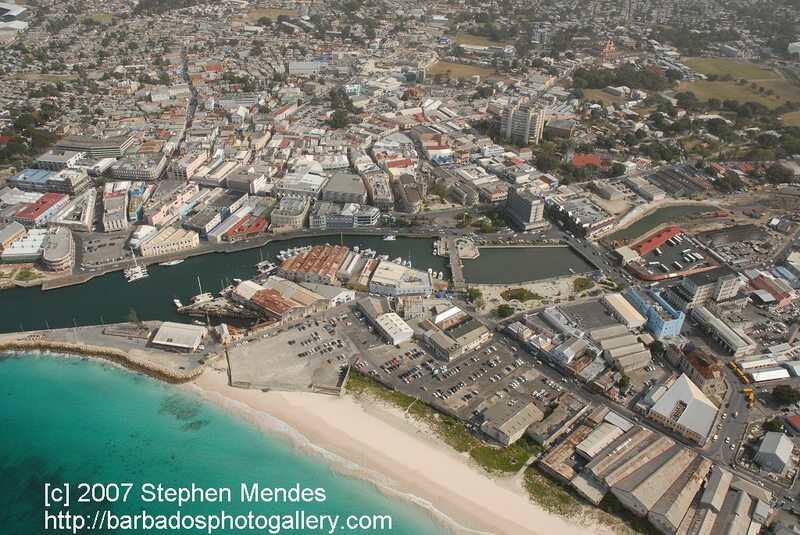 While fairly hot, Bridgetown is cooled somewhat by the trade winds that affect weather in Barbados in general. Bridgetown's record high of 33.1 °C (91.6 °F) on September 2005 and record low of 16.5 °C (61.7 °F) on January 2, 1984. Bridgetown features distinct wet and dry seasons, with a relatively lengthy wet season and a shorter dry season. Its wet season is from June through January, while the dry season covers the remaining months. For a city of its size, the Greater Bridgetown area is home to several prestigious educational institutions. The city serves as the seat of one of the three campuses of the University of the West Indies in the northern suburb of Cave Hill. The campus sits on a bluff offering views of Bridgetown and its port. The Barbados Community College is located three miles (5 km) east of the Central Business District in a suburb known as "The Ivy", while the sprawling campus of the Samuel Jackman Prescod Polytechnic is located just beyond the eastern limits of the city in a suburb known as "The Pine". In addition, the city houses such distinguished secondary schools as Harrison College, Combermere and The St. Michael School. Barbados Museum and Historical Society at the military prison at St. Ann's Garrison. Jackie Opel, credited as creator of experimental syncopated music genre called Spouge. ^ "Bridgetown, Barbados". Google Maps. Retrieved 20 August 2011. ^ "Population of Bridgetown, Barbados". Population.mongabay.com. 18 January 2012. Archived from the original on 9 June 2010. Retrieved 24 July 2012. ^ "Restore priority of B'town Redevelopment Plan". The Barbados Advocate. 21 March 2012. Archived from the original on 31 July 2012. Retrieved 14 April 2012. ^ Nantambu, Dr. Kwame (12 December 2005). "W.I. Federation: Failure From the Start". Trinicenter.com. Retrieved 1 September 2012. ^ Kasperson, Roger E.; Minghi, Julian V. (2011). "Decision Making". The Structure of Political Geography. New Brunswick, NJ: Transaction Publishers. pp. Pgs. 350–365. ISBN 978-1-4128-1854-4. LCCN 2011003509. ^ Lewis, Gordon K. The Growth of the Modern West Indies. pp. Pgs. 350–365. ISBN 976-637-171-7. ^ Ramsay, Allison (26 June 2011). "Barbados makes the list!". The Barbados Advocate. Archived from the original on 26 March 2012. Retrieved 26 June 2011. Historic Bridgetown and its Garrison site was considered for nomination after Barbados became signatory to the UNESCO Convention for the Protection of World Cultural and Natural Heritage Convention in 2002. Barbados submitted the nomination dossier to UNESCO World Heritage Centre on February 1, 2009, and that was among 45 proposals which were examined by the World Heritage Committee in June 2010. A total of 35 nominations including natural, cultural and mixed properties are being reviewed by the Committee. The session will end on 29 June. ^ "Historic Bridgetown now a World Heritage Site". Caribbean Broadcasting Corporation (CBC). 26 June 2011. Retrieved 26 June 2011. The World Heritage Committee, meeting in Paris, said Bridgetown and its garrison deserved a place on the List, which is comprised of more than 900 cultural or natural sites around the world regarded as having outstanding universal value. ^ a b c d Alleyne, Warren (1978). "I "The Beginning"". Historic Bridgetown. The Barbados National Trust. pp. 7, 8. ^ Carrington, Sean; Fraser, Henry (2003). 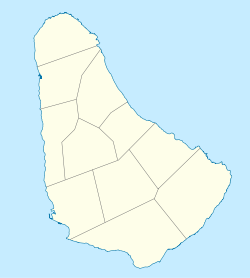 "Settlement of Barbados". A~Z of Barbados Heritage. Macmillan Caribbean. pp. 185–186. ISBN 0-333-92068-6. ^ "No. 20146". The London Gazette. 30 September 1842. p. 2631. ^ Alleyne, Warren (1978). Historic Bridgetown. Barbados: The Barbados National Trust. ^ a b "Barbados Weather Climate Data". Barbados Meteorological Services. Retrieved 6 November 2016. ^ "Station Grantley" (in French). Meteo Climat. Retrieved 6 November 2016. ^ "Trafalgar Square". Archived from the original on 30 April 2013. Retrieved 30 January 2005. ^ Mukherjee, Sharmistha. ICC Cricket World Cup draws record viewership. Business Standard. sify finance. 25 March 2011. Retrieved 15 July 2012. ^ "About Us – Company Information on REDjet Archived 18 April 2011 at the Wayback Machine." REDjet. Retrieved on 13 April 2011. "Its corporate offices are situated in Grantley International Airport in Barbados[...]"
^ "REDjet Terms & Conditions Archived 23 April 2011 at the Wayback Machine." REDjet. Retrieved on 13 April 2011. "Means REDjet Limited of Corporate Head Office Bridgetown, Barbados." ^ Miller, Dame Billie (9 July 2004). "Remarks by Senior Minister Dame Billie Miller at the Signing Ceremony on the Occasion of the Twinning of Bridgetown, Nova Scotia and Bridgetown, Barbados" (PDF). Foreign.gov.bb. Ministry of Foreign Affairs, Foreign Trade and International Business (Barbados). Bridgetown, N.S., Canada. Retrieved 19 January 2017. ^ Fox, Scarlett (22 October 2012). "Newsome Coach Orlando Greene: From Caribbean To Olympian". Retrieved 24 March 2016. Wikimedia Commons has media related to Bridgetown. Wikivoyage has a travel guide for Bridgetown.